The assessment is administered annually for schools and students who are enrolled in the program. It consists of a Baseline and an Endline assessment to ascertain program effectiveness and evaluates student progress in crucial components of reading. Deepak, a first generation English language student, comes from a small town in Rajasthan. When he joined the school in grade 2, he barely understood words on a page and passed his exams with great difficulty. After a year as a Wings of Words student, Deepak is unrecognisable, but in a good way. Deepak scored a truly wonderful 65% in his exam. Running the program for the last 4 years. 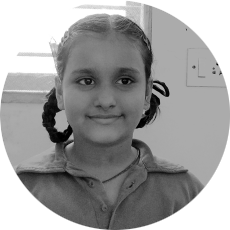 When she entered the first grade of DeepJyoti school in Mumbai, Moly was a very shy girl. She did not talk much, and couldn’t read even simple words. While writing even, she would end up copying the question instead of writing the answer. This happened because she could not comprehend what she read. When this school took up the program, they began to see a change in Moly. She participated in group activities and made more friends in the class. Exercises in sounds and blending helped her read new words confidently and within a few months, she could read and write sentences with ease. After three years of the program, she is now in class 4 and a smart, loving and confident child who is very proud of her language skills! Stuti and Gavin are adorable Kindergarteners, full of life and spirit. They are now on the cusp of first grade. When they entered Sr. Kg. in DeepJyoti School, neither of them could read or recognise alphabets. When Sheetal Panwar, their teacher introduced WoW Junior in the class, their live changed. Since phonics forms the base of instruction, children could pick up letter sounds, associate between the letter names and sounds, and what’s more, even read and write simple words! By the end of the year, due to WoW’s all round focus on literacy development, Stacy spoke and wrote more confidently and Gavin could read simple poems independently. How can I register on the app? If your school has subscribed to the WOW program, your coordinator must send in your details to our team, who will register you. Afterwards, you can log in with your mobile number. No problem! Click here to access the web version of the application. I didn’t receive an OTP. How do I log in? My child’s school has subscribed to the WOW program. Can I as a parent access this app? Not at the moment. As a parent, you can access Freadom, an app designed to raise a happy reader. I have been assigned to the wrong classroom. No problem – your school’s coordinator will be able to change that for you in no time. Please reach out to them. It is a part of the Wings of Words ecosystem. WOW teachers of all schools that subscribe to the program will receive this app.